Having braved the traffic into New York City yesterday (a one hour jam at the George Washington Bridge jammed inside a tiny cheap commuter "Spanish Bus") we are spending our day in New Jersey. It isn't so bad out here. In Teaneck, when someone sings "Oh! Tannenbaum!" they are usually singing a song complaining about their neighbors. We Yidn don't do Christmas around here. We do Nitl. Some more modern communities have a Dec. 24th party known as a Matzo Ball, but basically we are debating whether to go to a Greek diner or a Chinese Restaurant tonight, as we have for thousands of years. We've been enjoying the things we can only dream about in Budapest, products that come from being located next to an ocean, for example. Aron loves clams, something that he first encountered at the age of nine and has since internalized into an ethnic American craving that he can't get inside Hungary... kind of like Korean kids with sea squirts, perhaps. If you get a bag of a dozen cherrystones for $3.00 at the Korean market it means you get to kill your own meat... For those not familiar with the preparation of raw hardshell clams (all of Central Europe, for example) they have to be alive when you eat them. 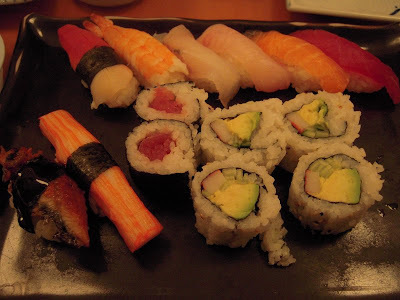 This is one step beyond sashimi in the sense of la cuisine de sadisme. I don't flinch. I have been shucking these babies since I was a kid. Not kosher at all! My sister also had us over for a feast of things we can only dream about in Budapest, like salmon steamed on a grill on cedar planks, a method the Northwest coast Indians used for eons to impart flavor into the salmon fillets. It doesn't overwhelm the meat, but it gives it that special something that spices do not. Perhaps the most prosaic thing we miss eating in Budapest is simple steak. Hungarians raise beef for stewing, not grilling. When the collective farms were shut down after the fall of communism, the large scale beef feed lots were also split into family sized holdings, meaning no more large scale beef production as families concentrated on small scale dairy farming. Exeunt beefsteaks. Hungary used to be famous for the quality of its beef. Now all you get is chunks of dairy cow for gulyás soup. No steak, regardless of what the butcher calls rostélyos. These thick ribeyes were the first steak I have crammed down my greedy gillet in over two years. I spent the afternoon researching the proper techniques to grill these babies and it paid off with juicy medium rare meat that I could not quit eating. I eventually entered a state of "meat coma" and do not have any recollection of getting home on my own. Now, I can understand why people do soft drugs. I don't do drugs. I do meat. It gets me to the same place. Knowing that some poor creature donated his life so that I can masticate on his rib muscle makes me feel at one with the world in a way that eating vegetables never can. And it tastes good. And besides: the New York Times this week pointed out that vegans can't hear plants cry. Meat coma was also the goal when Aron found a Calexico Carne Asado burrito cart in Soho yesterday - he had seen this featured on some food network show. When my incredibly mature and sophisticated son saw this cart he actually started whining... for the first time since he was a matchbox-toy-car-obsessed six year old (a decade ago) I heard the familiar rythymic incantation of "The Kid Wants Something:" "Pleeeease Papa!... Pleeeease Papa!... Oh... Pleease Papa..." Except now it was not directed at an alluring Matchbox car glimpsed in some toy shop window, it was directed at a burrito. He's growing, my son, and learning. And as we all know: Baby Cries? Papa Buys! I have to admit, this was a great burrito. Actually... it was a fantastic burrito, an apex of burrito technology and knowldge, it was the Mack Daddy of burritos, the Pope John Paul II of tortilla wrapped meat. It was that good. Aron has been getting burritos at the Arriba Taqueria near Oktogon in Budapest, and I have been telling him that as good as they seem, they ain't the real things. And this... damn... was. The real thing. Full of coriander and tender stewed beef, not too much rice. Why can't East Europe suffer from Mexican emmigration a little more? As Emma Lazarus inscribed at the Statue of Liberty: "Give me your tired, your poor... your huddled masses yearning to breathe free... the wretched refuse of your teeming shore... send these, the amazing cooks who use coriander and tortillas and goat meat to me... I lift my lamp beside the golden door." Or something like that. We started our day in Fort Washington, the Dominican neighborhood in Northern Manhatten where our bus lets us off from Jersey. It's just like visiting the Dominican Republic, only frigging cold and with subways instead of palm trees. Mexicans have moved into this area with a wide selection of fast, cheap Mexican food carts serving the Mexican workers communiting to and from New Jersey via the bridge, so you can stroll about sampling tamales and gorditas and tacos al pastor to your heart's content. Aron and Fumie needed tacos... the real kind, not some crisp salty thing at a highway fast food stand. We found a truck on 183rd St. offering the real deal: soft corn tortillas (always two of them) with more salad, avocado, and hot sauce than you can actually pick up. Carnitas de Puerco, Chicken, or chorizo for only $2.50. Can't beat that for fresh food value, even out of a truck on upper Broadway in freezing temperatures. Oh... and I almost forgot. To all our friends out there who await Santa and his reindeer sleigh full of gift certificates: Merry Christmas! Recently a friend of our quit Budapest and moved to the sunny coast of Dalmatia in Croatia. She sends us sms messages every few hours revealing what she has found in the local markets of Korcula, Split, or Rovinj... tuna, octopus, fresh sardines. This kind of news is harmful to those of us who still live in Budapest, where the only "seafood" is carp or frozen fillet of hake. So, Princess Oooh-La-La, consider this post a gentle version of revenge... welcome to New Jersey, an outlying province of the Republic of Korea! My family is lucky (although they don't seem to recognize it) to be living in a part of New Jersey which hosts the largest Korean community in the New York area - neighboring Palisades Park and Leonia are nearly 40% Korean, complete with an idiotic whitebread Mayor trying to enforce English language sign laws that would make a smallminded nationalist Transylvanian mayor (I'm talking 'bout you, Gheorghe Funar) seem insane. But the Koreans don't care. They have revitalized a series of dumpy old towns into vibrant kimchi suburbs. Don't like Korean food? Then go away right now. In this part of Jersey, you eventually come to like Korean food. We started our journey into the depths of garlicy cabbage pickles at the Fort Lee institution we discovered last trip: So Kong Dong Soft Tofu Restaurant. As Anthony Bourdain said before pigging out here "Soft and Tofu are two words that usually mean I don't want to eat it." 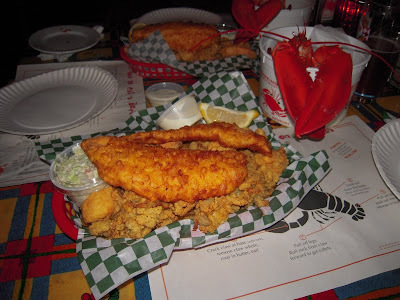 Put away your preconceptions: this place rates almost as high as Katz's Deli in my list of must eat in New York Foods. Almost everything on the menu is $9.00. The kalbi ribs are $15, but you must have them, so no complaining, they are said to be the best in the NY area -and there is a lot of competition in this area for tender marinated grilled kalbi ribs. The plan is to order your soft tofu soup and wait while the staff cover your table in kimchi and banchan - little dishes of hot pickled delights to accompany the rice. The rice is spooned into metal bowls: Koreans do not pick up their rice bowls like Chinese and Japanese. Tea is then poured into the hot stoneware rice serving bowl to make a special soupy tea-rice for those who like a bit of the burned rice as a hot beverage. Kimchi is an acquired taste for non-Koreans, and I highly advise you to acquire it. We have actually tried to make this at home in Budapest with varying success. And now the star of the show arrives: a cast iron bowl of bubbling hot tofu soup - I chose seafood and beef - into which you break an egg and then wait while the egg cooks. I looked around the packed house and a lot of the tables were filled with local Chinese people, not Koreans. So... this is what Chinese folk eat when they want to go out for something exotic and Asian. A classic aha! moment! Stuffed and satiated, we went out into the foot deep snow that had been dumped on New York the night before. Problem was, we no longer had kimchi in front of us. That was easily fixed by hopping into one of the many Han Ah Rheum supermarlets serving the local Korean community. These are huge Kimchi retailers, and you wonder how could anybody eat that much spicy fermented radish? But they can and do. A lot of non-Koreans help out - once you are hooked on fermented spicy cabbage and squid pickles, there is no turning back. The seafood at these markets is mind-boggling: fresh (as in alive) and cheap as you can find. These sea squirts were floating around waiting to be bought and consumed by adventurous eaters: this is about as out there as human seafood consumption can get. Described as "tasting slightly of urine" even the Japanese consider eating sea squirts something of a frat-boy challenge, definately not for everyone. Outside in the parking lot there was a wood fired iron stove cooking up yellow fleshed Asian sweet potatoes, a winter delicacy in Korea and Japan. 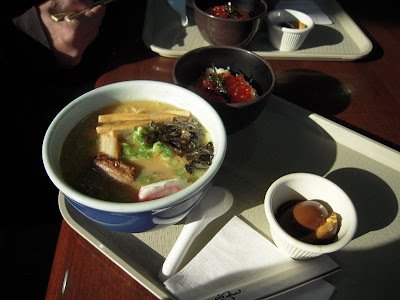 Speaking of Japan, we also hit the Mitsuwa Japanese Shopping Mall on the way into New York city for a quick fix of fresh Santoka Ramen noodle soup. This was Aron's first experience of real, fresh ramen soup, not the instant packaged soup that has taken over the world. He like. He like very much. 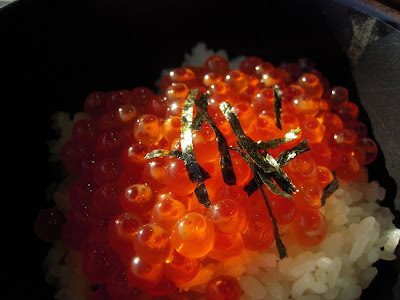 He also liked the accompanying bowl of rice topped with salmon roe. It is great to have a teen aged kid who says "fish eggs on rice? Yeah, Papa, I'll have some!" Last night we downed a dozen raw clams on the half shell from the Korean market. Maybe I will get him started on sea squirt sashimi before he heads back to Budapest. All this with a soy sauce hardboiled egg for $10.Like I said... we were not the first to discover that some of New York's best eating is across the Hudson river in New Jersey. Anthony Bourdain is from Leonia... just down the street from where I am typing this. He trod these same pathways in an episode of No Reservations a few years ago. New York, Just Like I pictured It: Skyscrapers, Dim Sum, and Everything! 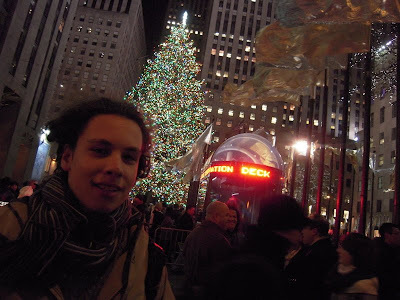 It is good to be in NewYork at Christmas time. New Yorkers are, contrary to the stereotype, extremely friendly and engaging, and love to start up friendly conversations anywhere, on street corners, on buses, waiting for subways. It always startles visitors who have just come from Hungary, where people tend to keep their comments to themselves unless they have something to loudly denounce or complain about in public (and they do.) Tooling about in the city with Fumie and my son Aron meant having ladies on the bus offer to help Aron dreadlock his hair (thanks for the offer, but it's just messy...) people commenting on Christmas, cops offering directions... it is my place of birth and if ever I was prone to nationalism, it would be New York nationalism. The crowds are a bit crazy in midetown Manhatten, but we did the obligaory Judeo-Nihonjin midtown pilgrimage (Rockefeller Center Tree, Kinokuniya Japanese book store...) Earlier in the day we made it to my favorite dim sum hall, the 88 Palace located inside the Chinese mall inside the Manhatten Bridge support columns on East Broadway. This is what I have been waiting for for over two years... dim sum heaven for me. The last time we were here it was Christmas day. 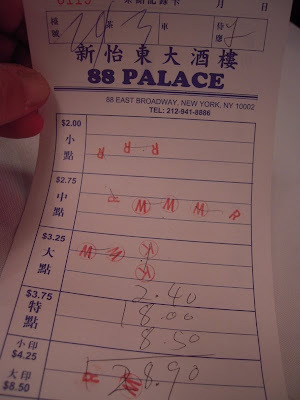 For those in the know, you want to get to a dim sum hall early in the day... noon is best if you want the good stuff, but the 88 Palace serves dim sum until 4 pm. 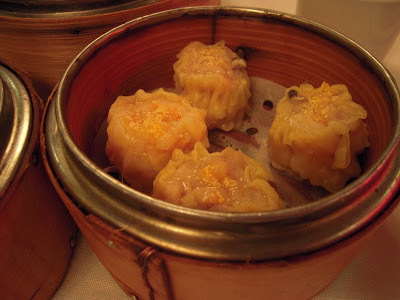 For those of you who have been living in a hole in the ground, or are from Austria, dim sum, or yum cha, is the Chinese style of eating small plates of appetizers and dumplings and making it into a full meal accompanied by tea, usually eaten early in the day and often by large family groups. Serving ladies roll carts among the tables, you point at plates, and keep the rythym going for as long as you can eat. You take chances, and you make pleasant discoveries. And - if you know where to go - it is incredibly cheap and satifying, if at times a bit daunting (I like steamed chicken feet... but not today... I was hoping for duck feet) The last time I was here was on Christmas day, and I was bowled away by the chive dumplings with shrimp, which were fried to order from a steam table. 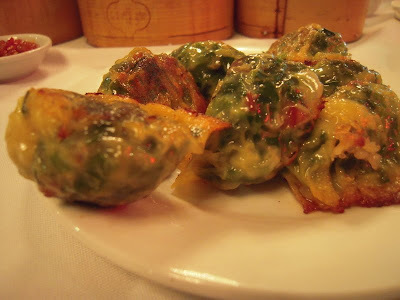 I grow Chinese chives on my balcony in Budapest, but we never get enough to go all out and make these dumplings. These were almost as good, but came off the steam carts. Shrimp wrapped in chee cheong fun rice noodles are a bit standard, splashed with a bit of sweetish soy sauce, but I think I may have a new dim sum love object in these. Very simple, but it brings back the sensation of having discovered chow foon rice noodles for the very first time. Later the har gow shrimp dumplings arrived.... hard to make a judgement between which I like better. 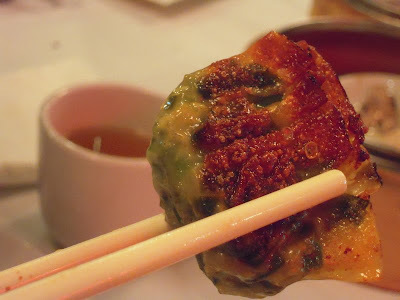 Shiu Mai dumplings are probably the dim sum that everybody in New York tried first, and the version at 88 palce was at the top of the game - big hunks of shrimp in a nearly meatless meatball sheathed in a wheat wonton wrapper. 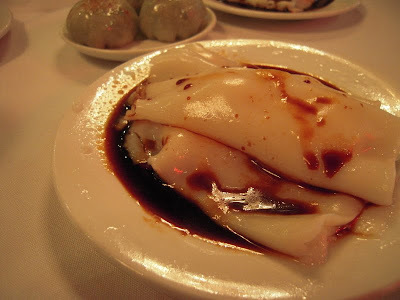 Dessert is silky fresh douhua "tofu in a light caramel syrup, spooned out from a cart by the woman who hovers around the tables waiting for ther slightest sign that you are not sufed painfully full of steamed black bean pork, taro cake, or shrimp dumplings. When you are served, she stamps your ticket for the eventual accounting. The best part is the price: three people, multiple plates, stuffed full and the bill came to $28. 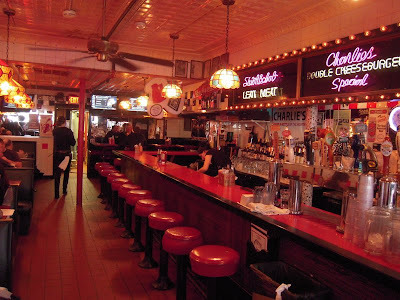 If you are going out in New York with a large group of people and and want to sit at a nice big table and not spend lots of cash or argue about who likes to eat what, this is the place to go. I am back in my home village, New York, NY for a few weeks. Got some work to do, but basically showing the smaller version of myself (AKA the Prodigal Son) my old stomping grounds, and taking Fumie around to places where Chinese food is good and cheap. Fumie will fly to Tokyo in a week... that means a lot of Chinese food is coming up. 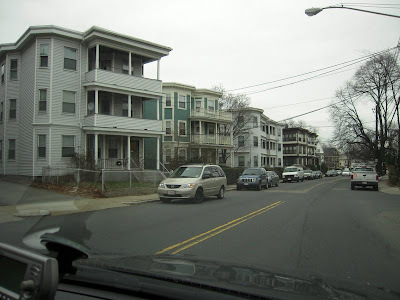 We spent the first two days of our trip in Boston and Cambridge, Massachusetts, where I once spent ten years living and playing music and making tapes for the teaching of African languages for the Boston University Language center before moving to Hungary in 1989.It was a bit of a shock to find myself rolling down the street in Allston-Brighton where I used to live in a ramshackle tripple decker full of BC law students. 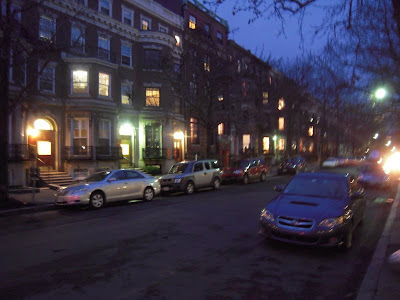 Since my sis was driving, it was a spur of the moment, unplanned trip, but I got to show Aron some of the best of the Boston area, such as the burgers at Charlies Kitchen in Harvard square, one of the last bits of Harvard square that has not been gentrified into a twee yuppie shopping mall. 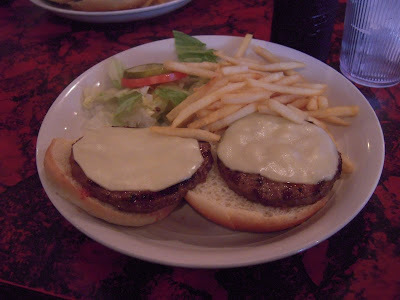 It hasn't changed a bit... double cheeburger plate, US $5.00. You can't get anything for lunch at that price in Budapest anymore... this is the place where the Goofy Sufi master Emil Dede and I used to go to feed Vlado, an aging and homeless Macedonian shepherd we found living in the heating system of Harvard University. Vlado was from Emil's home town, and we were trying to arrange to get him a passport and send him back to his family in Yugoslavia. I used to walk up and down Memorial drive in Cambridge playing the macedonian gaida bagpipes to find him - he would crawl out of some heating grate when he heard us coming. Charlies was the only place that would serve him. Romania is a big country. Unlike Hungary, which really boasts only one real urban center, Romania has several historic regions with regional capitals, and the cultures of the regions are different enough to keep any trip around Romania interesting. If you are visiting Romania, whatever you do, get the hell out of Bucharest! Transylvania is large enough to have several regional towns that reflect different local traditions, and my favorite is always going to be Cluj-Napoca, known in Hungarian as Kolozsvár, German as Klausenburg, and Romani as Kokoshvar. One feature of Transylvania is the cuisine: a mix of Romanian country food, Hungarian restaurant staples, and always served in huge piles. If anything is emblematic of Transyvanian cuisine, it would be the quantity. Quality counts, but you can't beat quantity. Any meat served in portions smaller than the size of your head is considered an appetizer. Soups are brough to the table in kettles so that you can refill your bowl. And my favorite place in Cluj for local food is the Pastaioase at B-dul Eroilor 35 in downtown, a few steps away from the Hungarian church. This place has been here for ages and serves cheap lunches with varză clujeana "Cluj Cabbage" its specialty. This is what Magyars know as Kolozsvári rakott káposzta, or Cluj style stuffed cabbage. If you are not from Hungary you may be wondering why I use multiple names for the town in different languages. When writing about territories that were once within the historic boundaries of the Kingdom of Hungary, Magyars always use the Hungarian place name. Hungarian newspapaers that even try to call a town by its Romanian (Cluj) or Serbian (Novi Sad) or Slovak name (Bratislava) are deluged by angry letters correcting the offending writer (Kolozsvár! Újvidék! Pozsony!) and the occasional violent street demonstration for breaking the rule. And since I am writing in Budapest, that last option is something one would want to take into consideration. I've actually had good friends, highly educated and well traveled Hungarians, grow livid because I used a Romanian place name in my writing, even when the topic had nothing to do with Hungarian history. As far as I am concerned, when writing about a place I prefer to use the name in the national language or just not be too tight assed about it. So there. We all eat stuffed cabbage, so who cares how we call it? And it is as good as it looks... smoked hunk of pork hock next to a pile of stewed cabbage with paprika and ground pork... thick water buffalo sour cream... this breaks about every rule of kosher eating in the book. You might not want to eat this every day, in which case you can have the simple smoked pork and beans dish on offer - ciolan cu fasole. This is the stuff that you want when you open a can of pork and beans, not that sweet goopy canned stuff we were raised with in the States! This is real Romanian truck driver food, and some of the best can be found at the road houses along the highway between Oradea (Nagyvárad!) and Huedin (Bánffyhunyad!) near Ciucea (Csucsa!) on the drive into Cluj from the north. Our meal came to about US $6.oo each. If, by any quantum leap of possibility, you have room for dessert, they have vargabéles, which is the Hungarian name for a sweet bread pudding dessert but in Transylvania it means straightforward Jewish lokshn kugel, noodles baked with sweet farmer cheese and raisins. Up in Maramures the Romanian peasants still call this kigl, a linguistic borrowing straight from the Hungarian pronounciation of Yiddish. 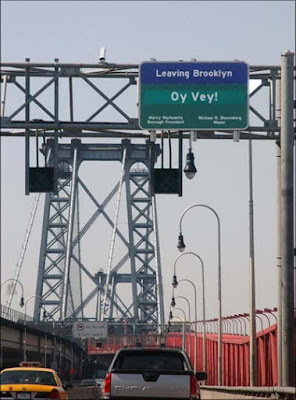 No surprise - Cluj was the home of one of the more influential Hasidic dynasties, the Klausenbergers, or Kloysenbuger hoyf, who are still around today in Brooklyn, Antwerp and Israel. There are several synagogues, including this one near the main market, now restored as a university research intitute for Judaistic studies. Now you have to walk that meal off... Even in absolutely crap weather I can recomend the back streets of Cluj. It is modernizing fast, like most Romanian towns, but you still find hidden bits of history on the back streets, like this house - built sometiome around 1750 or so - which has remained in place while the streets have risen in height over the centuries. The news is that I will be off to New York and the USA in a week, so I may miss Transylvania a bit (although some of the work I will be doing in NY will be tangentially Transylvania-related.) For the next two months expect a lot of in-depth looks at Korean and Chinese food, as well as discussions on the hermeneutics of Jersey's tiny hamburgers. But New York neeeds me... there are shopping malls in the New Jersey suburbs that might need some Transylvanian advice on how to really reach your target maket groups... and I've got some hot new marketing ideas that I picked up on my travels!